The California Writers Club has again signed up as a sponsor of the annual San Francisco Writers Conference and will have a prominent booth staffed by members of CWC NorCal Group. The Thursday-Sunday event at the Intercontinental Mark Hopkins Hotel on Nob Hill features keynoters New York Times and USA Today bestselling author Heather Graham, author/Red Sneaker Writers founder William Bernhardt, and New York Times bestselling author/activist John Perkins, along with many more bestselling authors, literary agents, editors, and publishers from major publishing houses. There will be networking opportunities, an opening gala, two keynote luncheons and breakfasts, open mic readings, and altogether 100+ sessions for writers, with subjects ranging from the craft of writing to the business of publishing. To read more: sfwriters.org. The 1888 Center interviewed CWC president Joyce Krieg on their podcast “The How The Why” on Oct. 30. (Find it on 1888.center.) The Orange-based 1888 Center has developed educational programs, collaborative projects, and a publishing agenda to advance its vision of “establishing a lasting cultural center in Old Towne Orange, CA, and transforming the City into the Literary Arts Capital of Southern California.” Most recently, they’ve announced a Writing Residency at Big Bear and the California Writers Club is working with them to get the word out. Read more at 1888.center. CWC-NorCal Group will provide an excellent opportunity to meet peers from other branches, hear success secrets from keynote speaker Sandy Baker of the Redwood Branch, and brainstorm solutions for challenges facing your branch. The event includes continental breakfast and lunch and is open to all branches within the CWC. The 32nd Annual Central Coast Writers Conference will be held September 29 – October 1, 2016, at Cuesta College, a non-profit educational institution, in San Luis Obispo, CA. Two members of the California Writers Club Coastal Dunes branch, Jenna Elizabeth Johnson and Catherine Kitcho, will speak at the Beginning Writers Bootcamp as well as on a panel addressing the importance of writers groups. This is the third year of CWC’s presence at the Central Coast Writers Conference, and the first that the CWC & Coastal Dunes CWC Branch have contributed to the Writers Contest awards. The 2016 Central Coast Writers Conference features 60 speakers offering lectures, keynotes, workshops and panel discussions on topics ranging from the craft of fiction and nonfiction writing, to editing, publishing and marketing. The conference attracts writers of all genres and levels of experience, and attendance is estimated to be approximately 400 people from all parts of the state. Additionally, the Conference’s Book and Author Fair will be held Thursday night, September 29th at Mission Plaza in San Luis Obispo, during the popular Thursday night Farmer’s market. The website is: centralcoastwritersconference.com. The CWC & CWC Coastal Dunes Branch will have a literature booth the conference. CWC’s High Desert Branch joins forces with “Barnes & Noble Book Fair” Sept. 17-22. If you purchase anything in-store at any Barnes & Noble Bookseller anywhere or online at BN.com using Voucher #11903309, High Desert receives a percentage of the sale. High Desert has done this before with good results and encourages other CWC branches to set up their own dates by contacting the Customer Relations Manager at the Barnes & Noble near the branch location. Further information is available at BN.com/bookfairs. CWC President David George presented the Ina Coolbrith Award to San Fernando Branch member Ray Malus at the July 24 Central Board meeting in Oakland, CA, at the Holiday Inn Airport Express. The organization’s highest honor, it recognizes exemplary service at the state level. In 2011, Ray received the CWC’s Jack London Award for service at the branch level. In his own branch, he designed the San Fernando Valley website, serves as its webmaster, was longtime editor of the branch newsletter The Valley Scribe, and represented the SFV branch on the CWC Central Board. Last year he retired from the position of Member-at-Large on the CWC Executive Board. Also on the state level, he created and developed the Member Record Management System (MRMS) for recording membership data and simplifying data entry. Since then he has provided user support, responding to suggestions and requests for filing needs, and adding enhancements. Bob Isbill of the High Desert Branch, who nominated Ray for the award, assisted David George during the ceremony. Bob was in turn assisted by his grandson, High Desert Branch member Kevin Morse. The California Writers Club is pleased to have a presence at this conference that mirrors the mission of own organization: to educate, encourage and support writers, help them build networks, and introduce them to writers, agents, publishers, and fellow creative spirits. This is CWC’s fourth year to have a booth at the conference. Our banner, designed by Joyce Krieg, was a 2014 addition. A new tri-fold display, designed for this 2016 conference by Deborah Bernal, will be an updated collage of some of our published authors’ books. The SFWC has already signed four keynoters: Annie Barrows (Ivy and Bean series for children and The Truth According to Us), Jane Friedman (Publishing 101 and former publisher of Writer’s Digest), Ann Packer (The Dive from Clausen’s Pier and The Children’s Crusade), and T. Jefferson Parker (Full Measure). There will be more than two dozen literary agents including Katharine Sands (Making the Perfect Pitch) and Kristyn Keene (ICM Partners). The CWC is a full sponsor of the 2016 San Francisco Writers Conference. When Linda Brown of the Berkeley Branch heard that C-SPAN would be filming in Oakland as part of its Cities Tour Series, she proposed that they include the CWC’s beginnings and its role in creating Joaquin Miller Park. Her efforts paid off. As soon as C-SPAN responded with interest, Linda gathered CWC props, books, and marketing material, and before long met with the film crew at Heinold’s First and Last Chance Saloon in Jack London Park. Another C-SPAN crew visited Joaquin Miller Park. The result: a spot over the January 2-3, 2016 weekend on C-SPAN Book TV and American History TV channels (San Francisco Bay Area channels 109 and 110) and Comcast channel 23. The City of Oakland recognized the California Writers Club and California Writers Week, the third week in October, with a ceremony preceding the Oct. 20, 2015 Oakland City Council meeting. City Council Member Annie Campbell-Washington presented the proclamation to CWC Central Board president David George and several local branch members of the California Writers Club. Councilmember Guillen and president Gibson McElhaney cosponsored the proclamation. 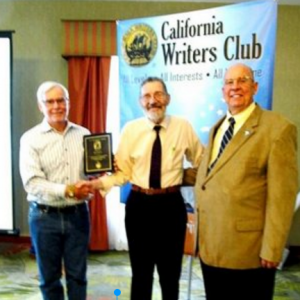 It cited in part that the California Writers Club honors all California writers, past and present, and continues to nurture the talents of new writers as well as established authors, and provides a forum for the sharing of their experience. The event took place in City Hall, around the block from where the original Oakland Library once stood. A little more than a century ago, Head Librarian, Ina Coolbrith introduced Jack London to books there, launching one of the seminal and most celebrated careers in California’s arts and letters. The CWC, now 106 years old, grew out of informal gatherings among Jack London, George Sterling, Austin Lewis, Joaquin Miller, and other friends in the Bay Area. Today it has 21 branches and nearly 2,000 members throughout the state. North State Writers (NWS), a group that meets in Chico in the Community Room of the Butte County Library, has become the 21st branch of the 106-year-old California Writers Club (CWC). CWC president David George and Margie Yee Webb (Sacramento Branch, CWC) who mentored NSW, presented their chartered certificate at the Monday, September 21 meeting. Speaker Deanna Leah, Foreign Rights Agent for HBG Productions, gave the program. North State Writers began as a group of published and hopeful writers and related professionals in the spring of 2013 as Chico Authors and Publishers Society (CAPS). Meeting monthly, they decided to apply to join the California Writers Club. The CWC Central Board unanimously voted them into its ranks this past July. Founding officers are T. E. Watson, president; Dan Irving, vice president; Lynn Tosello, secretary; Rick Hubbard, treasurer. Ken Young is director of membership. Looking ahead, NSW plans to provide programs, workshops, writing contests, and networking support, not only to serve the literary needs of local novice and professional writers, but also to make them available throughout a region extending from Yuba and Sutter counties on the south to the Oregon border on the north; and from the slopes of the Coastal Range on the west, to the Nevada border on the east. More immediately, they will participate in observing California Writers Week during the third week of October. Monthly meetings, which are free and open to the public, are held the third Monday of each month starting at 6:00 PM for socializing, with the actual meeting from 6:30 PM to 8:00 PM. North State president T. E. Watson, North State secretary Lynn Tosello, CWC Central Board president David George, CWC mentor to North State branch Margie Yee Webb. 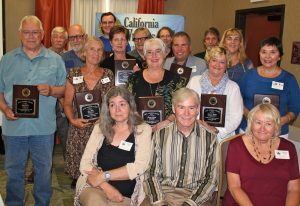 July 26, 2015: Oakland, CA –The 106-year-old California Writers Club (CWC) presented Jack London Awards to 14 members from branches throughout the state during ceremonies that took place at the Holiday Inn Airport Express. Established in 1973, the awards recognize outstanding service and dedication “above and beyond” to the organization. The governing body of the CWC bestows the award every other year to exceptional members nominated by their branch peers. This year’s honorees received their plaques from president David George and awards chair Doug Fortier. They were Barbara Bentley (Mt. Diablo), Carole J. Bumpus (San Francisco / Peninsula), Arthur Carey (Fremont Area Writers), Paula Chinick (Tri-Valley), Doug Fortier (Writers of the Mendocino Coast), Jeanette Fratto (Orange County), Steve Liddick (Sacramento), Dwight Norris (High Desert), Leslie Patiño (Central Coast), Colin Seymour (South Bay), Jeane Slone (Redwood Writers), Daniel Stallings (East Sierra), Joan Steidinger, Ph.D. (Marin), and Dennis I. VanderWerff (Writers of Kern). The California Writers Club, founded in 1909, grew out of informal gatherings of Jack London and his friends in the San Francisco Bay area. Today it has 20 branches throughout the state. The California Writers Club chartered the Coastal Dunes Branch, its 20th and newest, on July 1. The branch will officially receive its charter at a brief ceremony in Oakland, CA, on Sunday, July 26, as part of the CWC’s Central Board meeting. Coastal Dunes meets at the Nipomo Public Library in the southernmost town in San Luis Obispo County, on first Saturdays of every month. Agenda and networking begin at 10:30, with a speaker or other presentation following from 11 a.m. to 12:30. Upcoming Coastal Dunes programs include “Finding Success on the Poetry Journey“ by Jeanie Greensfelder on August 1, “Research, Research, Research—Ensuring Your Lies Look Like They’re Legitimate” by Ron von Freymann on September 12 (note date change due to Labor Day weekend), “A Duty to Betray: Evolution of a Psycho-Legal Thriller” by Kelly Moreno on October 3, and “Why We Love Mysteries” by Sue McGinty on November 7. The public is invited to attend. For more about the Coastal Dunes Branch, visit coastaldunescwc.com or write Coastal Dunes CWC, PO Box 734, Nipomo, CA 93444-0734. New Coastal Dunes CWC Branch receives its charter at the Central Board Meeting on July 26. L to R: CWC president David George, Coastal Dunes founder Catherine Kitcho, Coastal Dunes president Chris Ghormley. Photo by Joyce Krieg. The California Writers Club has partnered with Fearless Literary Services to offer a special 10% discount on publishing support ranging from initial manuscript assessments and coaching, to comprehensive, late-stage line-editing, to the design, production and marketing of both print and digital books. Founded in 1997 by D. Patrick Miller after he became dissatisfied with how major New York houses had handled his first three books, FLS has provided editorial assistance to hundreds of new voices and literary agents as well as major publishers such as Doubleday, Crown, and Simon & Schuster. Focusing on “shaping first” and accepting only a few jobs at a time, FLS customizes the attention given to each one. For more information about Fearless Literary Services, see www.fearlessbooks.com/Literary.html. To take advantage of the CWC member benefit, contact your branch Central Board representative. The 104-year-old California Writers Club (CWC) chartered its newest branch, Napa Valley Writers, on January 27. The branch grew from local writers who for years attended a creative writing workshop taught by Ana Manwaring, a California Writers Club member from Sonoma County. Manwaring encouraged them to hone their skills, enter contests and send out their work for publication. Inspired and energized, individuals initially joined the Redwood branch, then decided they had enough writers locally to start their own chapter. They have been meeting monthly since May of last year. Notable members now include Gary Silva, former poet laureate of Napa County, and novelist and educator Anne Evans who is active on the board of the Napa Valley Writers Conference. The group will hold its first meeting as the California Writers Club Napa Valley Branch on Wednesday, February 13, 6:30-8:30 PM at Whole Food’s culinary center in Napa. Novelist Linda Reid will present “Writing Outside the Box.” The public is invited. The requested donation for nonmembers is $5 ($3 for members). “We have had a wonderful response to our programs. We welcome the public to meet us and hear from local authors,” said Lenore Hirsch, president. “We’re for writers of all levels of experience and we look forward to seeing new faces in the room,” said Vicki Baird, membership chair. Future programs will feature Elsebeth Schoenberger on March 13, speaking about her novel concerning the Danish resistance, and writer, coach and radio host Marty Nemko on April 19, giving a “live” writing session. Regular meetings are scheduled for the second Wednesday night of each month, 6:30-8:30 PM. The location is subject to change. The California Writers Club grew out of informal meetings among Jack London and his friends in the Bay Area a little more than a century ago and today has branches throughout the state. For more information about the Napa Valley Branch, visit www.napavalleywriters.net. The 103-year-old California Writers Club (CWC) has 18 branches from Mendocino to Orange County and from the Coast to just outside Death Valley. Their speaker programs and workshops cover a wide variety of topics ranging from recording individual and family past to the future of publishing. Redwood Writers, the largest CWC branch, has sponsored a Memoir Contest open to the public and judged by authorities in the field. The East Sierra branch has developed a Family and Oral History seminar that they make available to libraries and nonprofit groups on request. The Marin branch created another traveling workshop, “So You Want to Write a Book” that they take to educational institutions. Additionally, some branches have responded to community requests and brought their skills and love of writing to prisons, and most branches have published anthologies of members’ works. CWC branches meet throughout the state to further their ongoing mission to foster professionalism in writing, promote networking of writers, mentor new writers and provide literary support for writers and the writing community. To attend workshops, programs and other events or to learn more about events and activities in your area, visit the website www.calwriters.org. The 103-year-old California Writers Club (CWC) continues to turn new pages in its ongoing mission to foster professionalism in writing, promote networking of writers, mentor new writers and provide literary support for writers and the writing community. The CWC has 18 branches from Mendocino to Orange County and from the Coast to just outside Death Valley. Recognizing growing interest on the part of established as well as aspiring writers, many offer speaker programs and workshops on the challenges and opportunities from the world of electronic publishing. Among them, both the Redwoods and South Bay branches have presented Mark Coker, who founded Smashwords – one of the premiere e-publishing and distribution companies – to change the way books are published, sampled, marketed and sold. In another South Bay talk, Matt Stewart spoke about Twitter as a novelist’s tool. Stewart successfully released his novel “The French Revolution” in 2009 in thousands of 140-character bursts. Berkeley’s Soft Skull Press subsequently published it conventionally, and the San Francisco Chronicle named it “best book of 2010.” A Marin branch panel discussion explored “Traditional Publishing or Self-Publishing: Which One’s For You?” The East Sierra branch featured Brett Battles, award-winning mainstream thriller writer, who explained the intricacies of transitioning to electronic publishing in the current publishing climate. Branches also cover a wide range of other topics, from memoirs to comedy writing to breaking into television, and most hold “open mics” The Sacramento Branch, for example, hosts Open Mics at the Birdcage Center Barnes and Noble on second Fridays monthly at 7 PM. Additionally, some branches have responded to community requests and brought their skills and love of writing to prisons. Most branches have published anthologies of members’ works. CWC branches meet throughout the state. To attend workshops, programs and other events or to learn more about events and activities in your area, visit the website www.calwriters.org. 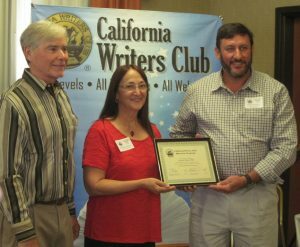 July 31, 2011, Oakland, CA – The 102-year-old California Writers Club (CWC) announced 15 recipients of its prestigious Jack London Award at its biennial Jack London Awards Luncheon, held this year at the Holiday Inn Airport Express. These honors, established in 1973, recognize dedication “above and beyond” to the organization. The governing body of the CWC presents them to exceptional members nominated by their branch peers. Keynote speaker Susan Snyder, head of public service at The Bancroft Library at the University of California and author of “Beyond Words, 200 Years of Illustrated Diaries” just released by Heyday Books, discussed the Bancroft’s collection of CWC documents. Her comments on club history and heritage gave added context to the contributions of the 2011 awardees. California Writers Club president Robert Garfinkle and Jack London Awards chair Nancy Curteman conducted the ceremony, acknowledging recipients David Baker (Berkeley branch), Harold Grice (Central Coast), Myrla Raymundo (Fremont), Carol Warren (High Desert), Sharon Herdina (Inland Empire), Kathryn Atkins (Long Beach), Tanya Egan Gibson (Marin), David George (Mt. Diablo), Linda McCabe (Redwood), Margie Yee Webb (Sacramento), Ray Malus (San Fernando Valley), Ann Foster (SF/Peninsula), Richard Amyx (South Bay), Lani Longshore (Tri-Valey) and Dana Martin (Writers of Kern). Branches of the California Writers Club meet throughout the state. To attend workshops, programs and other events or to learn more the CWC, visit the website www.calwriters.org. The 102-year-old California Writers Club chartered the Writers of the Mendocino Coast as its newest branch on July 31. The 100-year-old California Writers Club has announced centennial plans that include a time capsule for which people are invited to submit ideas on what print media will be like a few decades from now. Additionally, there will be a literary landmark map, centennial website, anthology, contests, workshops and conferences for members and the general public. California had only been a state for about 50 years when Jack London and some of his friends started meeting. California had produced writers before, but suddenly there were enough of them to band together to support one another in their struggles. These gatherings became the California Writers Club, the oldest professional writing organization in the West. Today the CWC has more than 1000 members in 16 branches throughout the state. The South Bay and Redwood branches hosted writing workshops in January. Among upcoming special events planned by the branches, the East Sierra Branch will tour a family and oral history workshop, the San Francisco / Peninsula Branch will hold the two-day Jack London Writers Conference October 10-11 at the Crowne Plaza Hotel, Foster City, and the Redwood Branch will take programs to schools, and present the Redwood Writers Conference October 23-24 at the Flamingo Hotel and Resort, Santa Rosa.